Occupational Therapist ~ Kim joined the High Pointe team in August 2016 with over 17 years of pediatric occupational therapy experience. She is a 1999 graduate of Wayne State University in Detroit, MI. Kim grew up in Michigan and practiced therapy for 8 years before marrying her husband in 2007. That is when their big adventure as an active duty military family began! Kim has one daughter and one son who keep her busy. If that wasn’t enough, they decided to adopt a rescue pup Max shortly after they arrived in Clarksville. Kim thoroughly enjoys working with kiddos of all ages and values the role of parents as integral parts of the therapy team. 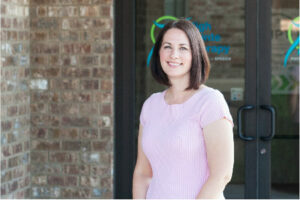 She also has many years of specialized training in sensory integration and oral motor and feeding. Her main goal is to make therapy fun, playful, and focused on function.